One only. 195/65/15 Goodyear Eagle LS allseason tire. Like new. $50. Two only. 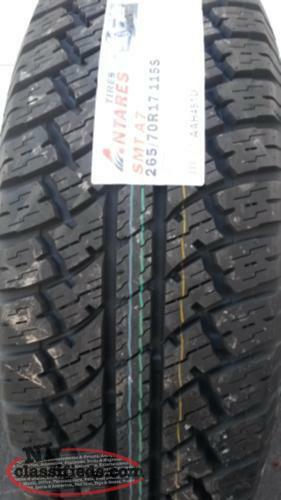 LT245/75/16 Sailun Terra Max H/T tires. App 50%. $120. Three only. 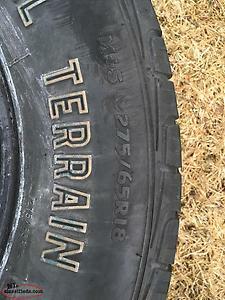 215/70/16 Motormaster Total Terrain studded winter tires. App 40% worn. $120. One only. 215/70/16 nexen all season tire. Only 30% worn. $60. Two only. LT245/75/16 Champerio Ice Pro studded winter tires. Good shape, app 50% worn. $130. 4 new 265/70/17 truck tires passenger rating. NOT 10 PLY. $175 each. Hi, I'm interested in the 'TIRES; Car, Truck, SUV.' posted on NL Classifieds! Please contact me if still available.